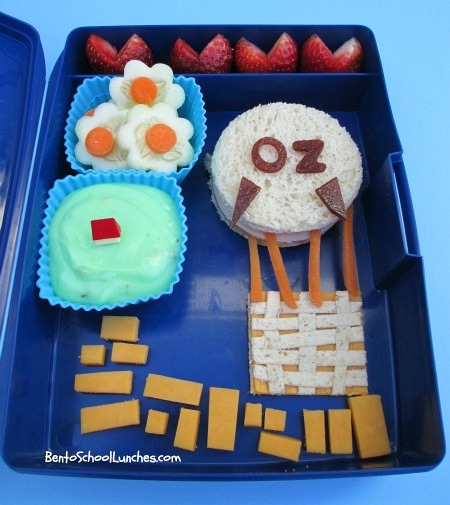 Bento bloggers and friends are joining together for a Wizard of Oz themed blog hop to celebrate the release of the new Oz movie. Make sure to scroll down to see what my bento friend Rebecca over at BentosontheBayou came up with. Have a wonderful weekend everyone! Up top is a row of heart cut strawberries. Flower shaped cucumber slices with baby carrot slices for center. Pistachio pudding as the "Emerald City" with "Oz's house" pick. Yellow brick road of mild cheddar cheese. Woven slices if flattened bread/cheese "wicker basket" suspended beneath balloon sandwich by thin carrot slices. Lettering and accents are fruit leather. Packed in Laptop Lunches. Click to check out the next one from BentosontheBayou or click on the image below. See what others have made by hopping through the rest of the Blog Hop. Adorable hot air ballooon, Rina!! The balloon is great, and love the little house in the middle of Emerald City!! Thanks so much Sarah, glad that you spotted the little house! I love your hot air balloon!! Beautiful! So cute! Creative use of pistachio pudding and I love your balloon basket! Thanks so much Kathy. The basket is my favorite of all! So cute! Love your hot air balloon and how you've used the little house pick to represent his house in Emerald City! bentodays, thanks so much! I was so happy when I found that pick in my collection of picks! Very cool! Love the hot air ballon and the yellow brick road. Anna, thanks so much! Glad to know you like the brick road, that was my last piece when I made the bento and I was rushing. I can't believe you wove the basket, brilliant!!! I love it! Venia, thanks so much! The basket is my favorite and I had fun making it. Wow that hot air balloon is awesome! The whole thing is so cute! Such a beautiful lunch, Rina! That basket weaving is pretty awesome as is the entire lunch! love it! happyvballgirl, thanks so much and glad to know you love it. Rina, this is adorable! I love the basket on the hot air balloon! Thanks so much Caren, the basket is my favorite! Love the balloon! That is very clever! Rina, I love it all. The flowers are adorable and the balloon basket is amazing. Thanks so much Keitha! I enjoyed making the basket. Love the hot air balloon, so beautiful! Again, you never fails to impress me on your neatly arrange bento! Very Good Details! I want to See The Movie too And think about your bento while watching ;). Have a nice Weekend too! Thanks so much Midori, you are too sweet and I hope you enjoy the movie! Love the yellow brick road, and that is a fantastic balloon! Love it! Thanks so much Kendra, glad to know that you love it! This is so cute! Love the air balloon and all the little details in the flowers! Lau-raw, thanks so much for your kind comment!